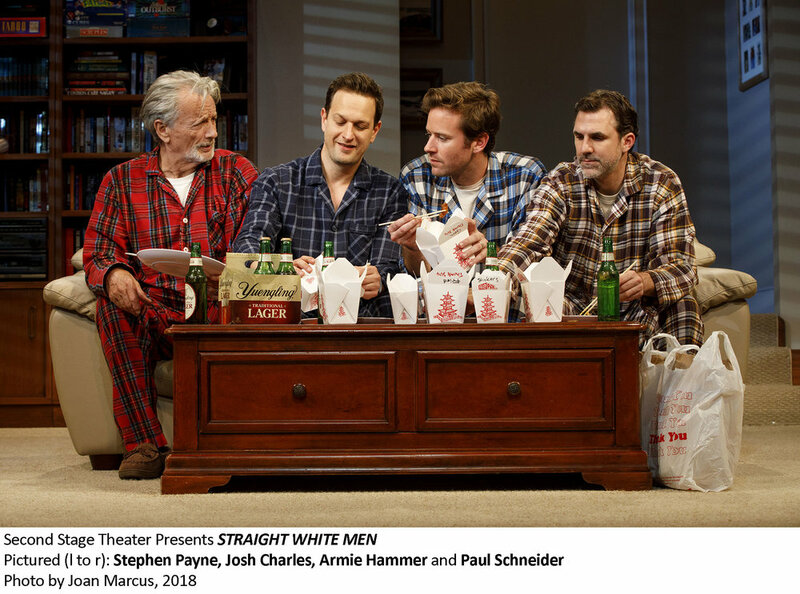 Straight White Men, in its author's maiden Broadway voyage, closes on Sunday, September 9. Straight White Men shouldn't close. Not until everyone sees it who could benefit from its cathartic powers, and you don't need to be straight, white, or male. Searingly directed by Anna Shapiro, the four-hander starring Josh Charles, Armie Hammer, Paul Schneider, and Stephen Payne is uncomfortable, unexpected, and undeniably provocative. It's uncomfortable because it's the work of Young Jean Lee, a writer who excels at finding words for the unsayable—both by daring to go where no politically correct has gone before, and by picking up on the layers of ego and emotion that twist humans into identity crises of which no two are alike. The play is unexpected because, billed as a Christmas Eve drama between straight white men, you arrive with a certain set of assumptions. 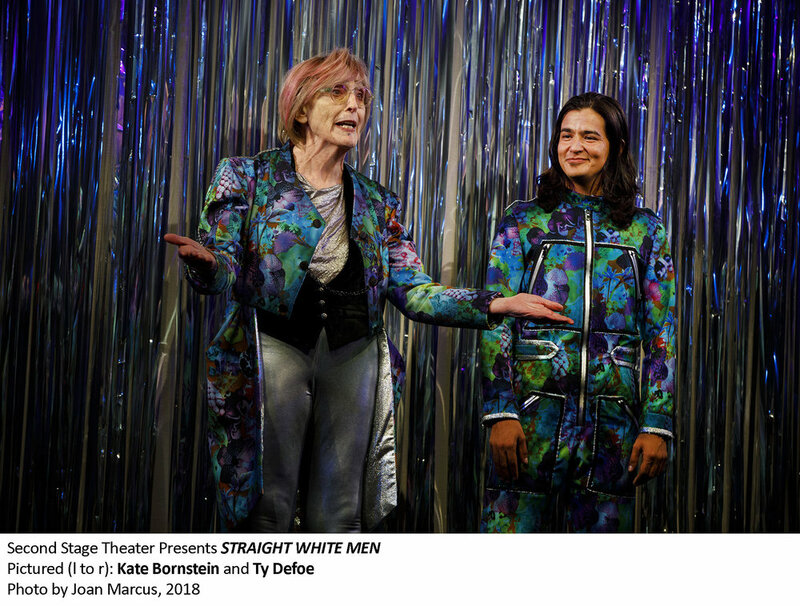 That's before a senses-assaulting pre-show, officiated by a self-described non-binary Kate Bornstein and Native American Ty Defoe, of "transcending gender in the Ojibwe language," forces you to re-set. When the garish silver curtain then rises on precisely the type of hyper-real living room you expected in the first place, you are treated to thrilling theatrical contrast, Oz in reverse. After an unflattering "All American" opener between two of the play's three grown-up brothers (think regressive behavior over a video game), Lee provides another surprise. Instead of good ol' boys, behold a family of progressives! A Midwestern, upper-middle class, highly educated family come home for Christmas with their amiable, aging dad. The mother is conspicuously absent and the fact of her death is soon confirmed along with her politics; in life she had been intent on not raising three straight white assholes. When they break out an old family-made board game called Privilege, a satirical Monopoly in which you are penalized for insensitive behavior, the father recalls, "One of your mother's craftiest inventions." The mother's void looms achingly over the show, a sense contributed to by Todd Rosenthal's poignant set. When a bathroom door opens to reveal a dated pink decor, the stage fills with loss; when the boys pat their brows with Mom's old pink towels, it could be her absent hand. These tender touches universalize the men's condition and highlight their struggles; the kids are not all right. The "kids" are Harvard-educated Matt (Paul Schneider), the oldest who has recently moved back home, Jake (Josh Carles), a successful, recently divorced father of two with a soft spot for Santa, and Drew (Armie Hammer) a novelist, professor and ex-nihilist cured by and therefore obsessed with therapy. Loaded with the intensity of homecoming, especially at Christmastime, the boys' constant "teasing" flirts with conflict and offense. When Matt inexplicably breaks down crying, he carries the subtext of the play with him—the iceberg beneath the bluster. Mr. Schneider's portrayal is so empathetic, I wept instantly and heartily with him. For the loss of innocence that is palpable, for the unhappiness that knows no source. As the men react differently to Matt's display, a classic family cycle of attack and retreat ensues. In their half-baked philosophies, jabs about white guilt or the lack thereof feel secondary to the real story behind Lee's ironic title: an American Tale about how people halfway through life can find themselves without an ideology and stuck between faking it or giving up. ED: What's one thing you're not good at that prevents you from succeeding? ED: Selling himself? Why does that matter? JAKE: Today that’s all that matters. JAKE: Okay. Back in your day, people were all like, "Hey, you got a skill? Great, we'll pay you to use it." Nowadays it doesn't matter if you have any skills or not. You sell yourself, not your skills. But Matt doesn’t care about that. Jake continues to speak about Matt as if he isn't there, providing the only narrative he can take, that his big brother is underperforming on purpose. Conversely for Drew, depression and therapy are the only answer. When Matt defies either explanation, insisting "I am okay, I feel useful," his Candide-like* compromise is unacceptable to his family and forces the play to a tragic non-conclusion. 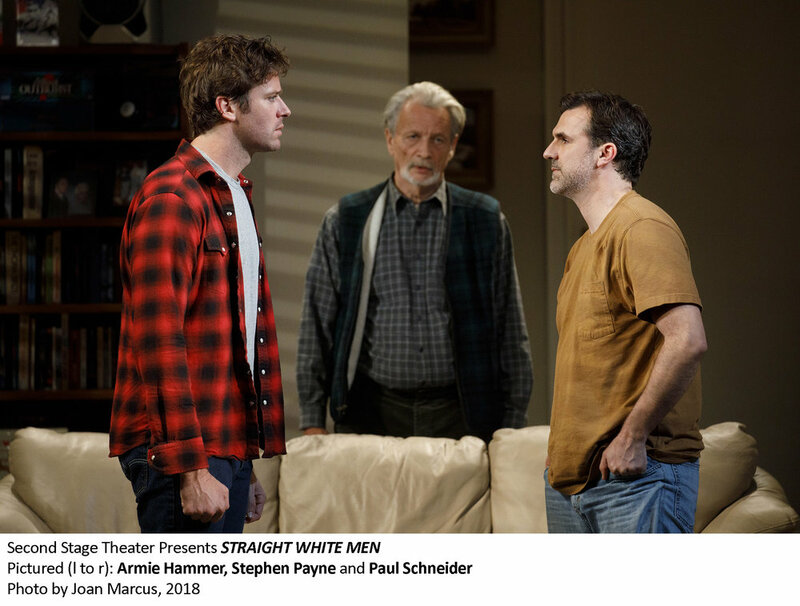 Straight White Men is a play about identity at an impasse, about culture in crisis, about the real baggage that privilege and freedom carry. But above all it's about coming home, perhaps adding to the evidence that life is a process of running from and returning to our roots. From Odysseus to today, this will always be the stuff of drama. *The more I think about Candide, the more I'm certain Lee did, too. Matt goes so far as to say that faced with his indecision, his (late) mother would "tell me to take a walk every day around the lake, and to fix her garden. She would say there’s nothing you can do to erase the problem of your own existence. She would tell me not to despair, and to keep trying to find my way."